Home » Cool Car Stuff » Exterior Care » Washing, Polishing, and Waxing » Meguiar’s Black Paste Wax Review: Is This the Best Wax for Black Cars? Meguiar’s Black Paste Wax Review: Is This the Best Wax for Black Cars? If you have an older black car and you are looking to restore the like-new smoothness and gloss of your paint, this product is not right for you. But if you’re looking to save time and restore that deep, beautiful shine that your black car or pickup used to have, then the Meguiar’s black (magic) past wax is pretty awesome! If you want maximum results, use a polisher and two coats. It might not clear out all the deep swirls, but it still looks dang good… and saves me at least an 1 of waxing. Is it the right wax for your black vehicle? Let’s see how a second coat looks…. Let me tell it to you straight: I am a huge fan of Meguiar’s products. I am a sucker for everything from this brand. You can buy other waxes and polishes at a lesser price, but for me at least, nothing beats the cleanliness and shine of Meguiar’s waxes and polishes. 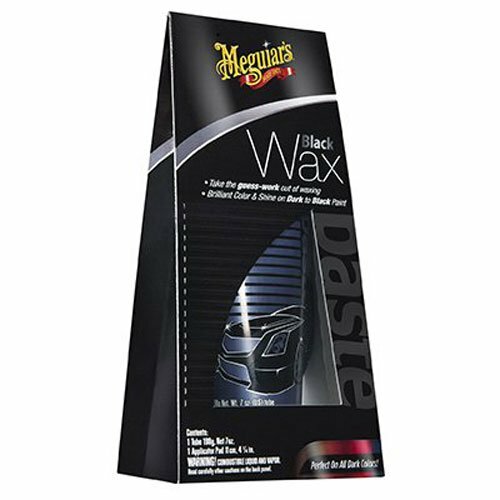 I was curious about the Meguiar’s Black Paste Wax. Is it a wax? Is it a polish? Is it similar to other black waxes that contain dyes or colorants? Those were the questions lingering in my head prior to this hands-on review of one of the most sought-after car waxes for black cars. I also found that there is a “white paint” version of this Meguiar’s Paste (you can find it here)… but for this review, I’m focusing on the Meguiar’s G6207 Black Wax Paste. For this review, I bought a 7 oz. tube of the Meguiar’s Black Wax and proceeded to wax my black 2013 Nissan Maxima. There were swirl marks all over the place so it was the perfect opportunity to test the power of the product. We’ve been writing a lot about keeping your ride clean, so don’t miss our write-ups how to wash a car and the right way to wax your vehicle. Unlike the Meguiar’s Ultimate Polish (which is a pure polishing glaze that you apply to the paint prior to waxing), the Black Paste is actually a 2-in-1 product. It is formulated with micro-polishing agents to buff out light scratches and swirl marks to produce a smooth, glossy, and deep shine. Meguiar’s Black Paste Wax is a dream come true for people who have no time to polish and wax their black cars. yeah… water beading. That’s the sign of a good fresh wax. Black paint looks incredibly beautiful when properly cared for, but it takes a LOT of work to maintain that prestigious and flawless look. The Meguiar’s Black Wax is a one-step process that will combine the benefits of waxing and polishing so you can restore the beauty of black paint in half the time. But does this promise hold true? I dedicated an entire Saturday to test the Meguiar’s paste on my black Nissan Altima and here’s what I found out…. Whenever a product states that it can perform the functions of a polish and wax, I always have doubts since there will be compromises no matter the case. In order to fully test the efficiency of the Meguiar’s, I compared it to a surface that has been polished separately and waxed using pure carnauba. I applied masking tape in the middle of my car’s hood. The right side will receive a proper treatment of pure polish and a separate wax. The Meguiar’s Black Paste Wax comes with a hand applicator pad so I whipped out my elbow grease and got to work. First, I treated the right side of the hood with pure polish. After wiping off the excess and buffing the finish lightly by hand, I proceeded to apply a light coat of pure carnauba wax. While allowing the wax to dry, I treated the left side of the hood using the Meguiar’s paste. I really thought this product was a paste because it had a fairly loose consistency. The product itself is not black. It has a dark grayish hue since it doesn’t contain any dyes or dark colorants. I applied a light coat of black wax and allowed the product to dry to a haze. By this time, the right side (carnauba side) was dry enough to be buffed lightly. I grabbed a dry microfiber towel and removed the haze. I grabbed a separate towel to remove the haze of the black wax as well. I was pleasantly surprised when I stepped back from my 2 hour wax application. The part that was treated with the Meguiar’s looked almost the same as the other side treated with the pure carnauba. However, while the black wax was able to make very light swirl marks disappear, it didn’t do a great job of lightening out deeper swirls. On the other hand, the side that was treated with polish and wax looked cleaner with less obvious swirl marks. I wasn’t yet fully satisfied with the results of the single coat of Meguiar’s paste…. Then I had an idea! I decided to apply a second coat of the Meguiar’s Black Wax, but this time I’m going to use a dual-action polisher. I applied a light coat and worked the product evenly on the hood. 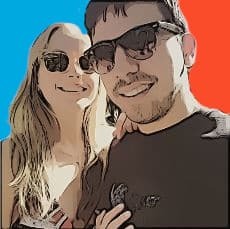 I buffed out the excess and the results were amazing. Applying the second coat made a huge difference since the visible swirls were almost gone. When I’ve got plenty of time on the weekend and a six pack, I’ll whip out the carna wax and polish for detailing my car because I prefer the mirror-like finish of a polished and waxed finish. But I gotta say, using the Meguiar’s black paste wax cuts detailing time in half! I’ll be picking up more of this stuff!